Last year, a caravan of 3,000 Central American migrants made its way through Mexico in hopes of seeking asylum in the U.S. Last week, the Los Angeles Times reported that another caravan of 1,800 Central American migrants was making its way into Piedras Negras, Mexico. Here in L.A., a pair of young, first-generation Americans, Daniel Buezo and Weleh Dennis, co-founders of the clothing line Kids of Immigrants, are partnering with non-profit organization Border Angels to help migrants seeking asylum on the U.S.-Mexico border. 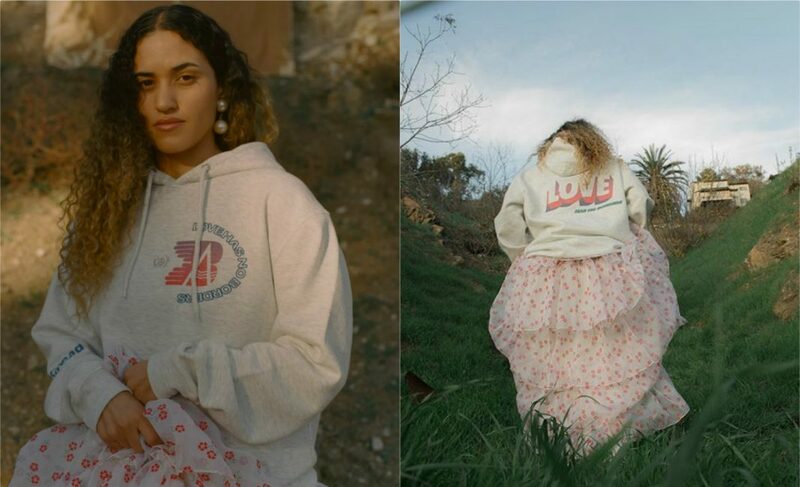 For the collaboration they designed an oatmeal-colored hoodie, made in L.A., emblazoned with messages like “Spread Love,” “LOVE Has No Borders,” as well as the Border Angels website. All proceeds from the “Love Has No Borders” sweatshirt, modeled by L.A.-based Honduran pop singer Empress Of, will help fund a wing of shelter in Tijuana. “Our goal is to raise $8,500 to add an extra wing at the Border Angels shelter in Tijuana to aid more migrants. The shelter houses men, women, and children from Honduras, El Salvador, Guatemala, and more,” they wrote on their GoFundMe page. This isn’t the first time they’ve given back to the community. “Since their launch, they have worked with many nonprofits in the L.A. area that supports and provides art education and creative spaces for underserved youth such as Inner City Arts in Skid Row, We Are Lightwork, Akasa Community, and most recently with Artworx L.A., that serves dozens of high schools in the city,” a Teen Vogue article explains. Buezo, whose parents immigrated to the U.S. from Honduras, and Dennis, whose parents hail from Liberia, want to use their influence in pop culture, fashion, music, and art to shed light on their communities. “Our parents took the same risk as those seeking asylum now. We wouldn’t be here without them,” they said. You can order the Kids of Immigrants x Border Angels hoodie, available through February 28, here. Donations can also be made here through their GoFundMe page.